It is a fantastic fantasy, I know. Family and friends will confirm that I often entertain fantastic, even ridiculous, fantasies. Yet nonetheless I dream: if every Orthodox, Catholic, and Protestant pastor were to read the Unspoken Sermons of George MacDonald, the Church of Jesus Christ would experience an extraordinary revival in the Spirit. My fantasy, of course, extends to every layman; but my experience in parish ministry has taught me that congregational renewal is too often cut short by the spiritual obtuseness of the clergy, and so I focus on them. My fantasy also extends to the theologians … but they are a hard nut to crack, even for the LORD. But it’s my fantasy. Has not the Lord taught us that all things are possible? But where to begin? I am no where close to having read all, most, or even a goodly number of MacDonald’s sermons; yet so impressed I am by the revelatory power of MacDonald that I will dare to commend my favorite: “The Consuming Fire.” I imagine that any number of the unspoken sermons might ignite the revival for which I pray; but at this moment “Consuming Fire” tops my list. Renewal in the gospel always begins with the preaching of the absolute love of God who is Love. Apart from Love, all talk of morality, good works, ascetical prac­tices, social reform is impotent. Yes, prophetic exhortation can sometimes mobilize human effort (for good or ill), yet the hearers remain as dead in their sins as before. It is Love, always Love, that is the one thing needful. It is this Love that speaks to the depths of the human heart and brings conversion and rebirth in the Spirit. If our congregations are joyless and dull, it is because our pastors do not proclaim to us the divine Love. If we are dead in our spirits, it is because we have never met Love or because we have allowed the love once born by Love to diminish to barely glowing embers. Only Love can raise the dead. You are accepted. You are accepted, accepted by that which is greater than you, and the name of which you do not know. Do not ask for the name now; perhaps you will find it later. Do not try to do anything now; perhaps later you will do much. Do not seek for anything; do not perform anything; do not intend anything. Simply accept the fact that you are accepted. For love loves unto purity. Love has ever in view the absolute loveliness of that which it beholds. Where loveliness is incomplete, and love cannot love its fill of loving, it spends itself to make more lovely, that it may love more; it strives for perfection, even that itself may be perfected–not in itself, but in the object. As it was love that first created humanity, so even human love, in proportion to its divinity, will go on creating the beautiful for its own outpouring. There is nothing eternal but that which loves and can be loved, and love is ever climbing towards the consummation when such shall be the universe, imperishable, divine. God intends our good. He intends that we become the kind of people who can enjoy his Trinitarian fellowship for all eternity. He intends that we become fit for his kingdom. For this purpose God became Man, died on the cross, and rose into glory. For this purpose the ascended Christ has poured out his Spirit upon all flesh. We will be consumed in the fire of his Love. But we shall find that this very revelation of fire is itself, in a higher sense, true to the mind of the rejoicing saint as to the mind of the trembling sinner. For the former sees farther into the meaning of the fire, and knows better what it will do to him. It is a symbol which needed not to be superseded, only unfolded. While men take part with their sins, while they feel as if, separated from their sins, they would be no longer themselves, how can they understand that the lightning word is a Saviour—that word which pierces to the dividing between the man and the evil, which will slay the sin and give life to the sinner? Can it be any comfort to them to be told that God loves them so that he will burn them clean. Can the cleansing of the fire appear to them anything beyond what it must always, more or less, be—a process of torture? They do not want to be clean, and they cannot bear to be tortured. Can they then do other, or can we desire that they should do other, than fear God, even with the fear of the wicked, until they learn to love him with the love of the holy. To them Mount Sinai is crowned with the signs of vengeance. And is not God ready to do unto them even as they fear, though with another feeling and a different end from any which they are capable of supposing? He is against sin: in so far as, and while, they and sin are one, he is against them—against their desires, their aims, their fears, and their hopes; and thus he is altogether and always for them. That thunder and lightning and tempest, that blackness torn with the sound of a trumpet, that visible horror billowed with the voice of words, was all but a faint image to the senses of the slaves of what God thinks and feels against vileness and selfishness, of the unrest of unassuageable repulsion with which he regards such conditions; that so the stupid people, fearing somewhat to do as they would, might leave a little room for that grace to grow in them, which would at length make them see that evil, and not fire, is the fearful thing; yea, so transform them that they would gladly rush up into the trumpet-blast of Sinai to escape the flutes around the golden calf. Could they have understood this, they would have needed no Mount Sinai. It was a true, and of necessity a partial revelation—partial in order to be true. 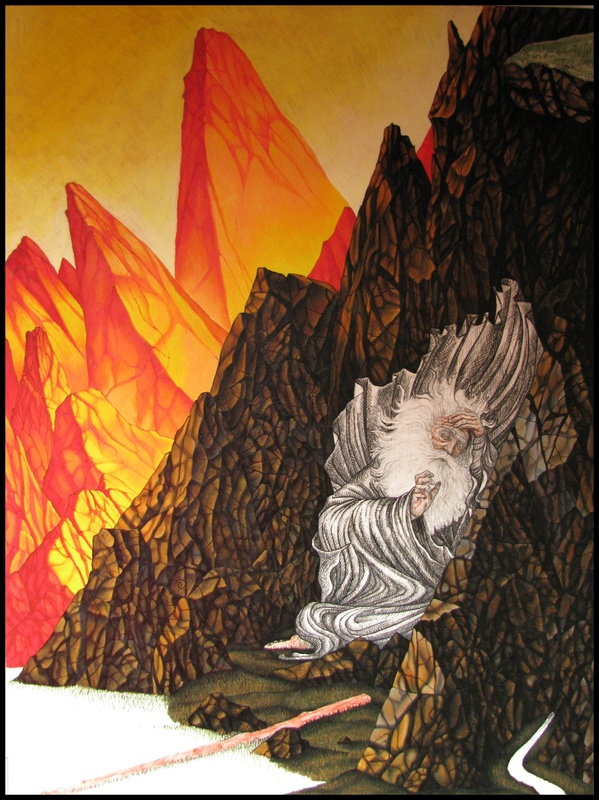 This entry was posted in Inklings & Company and tagged burning bush, George MacDonald, God, Moses, progressive revelation, renewal, Sinai, unconditional love. Bookmark the permalink. I haven’t worked my way through all of the Unspoken Sermons, and while The Consuming fire will likely always be my favorite, I found that The New Name had a profound effect on me. It paints an arresting picture of the value God places on the individual, and how he has designed the individual to be a unique blessing to the whole. Fr. Kimel has a great reflection on George MacDonald’s famous (unspoken) sermon The Consuming Fire. This post is well worth the read. What a blessing for us to be given George McDonald and CSLewis in our lifetimes,truly wonderful. I can see how the idea of a consuming fire as love, as inviting, welcome, and voluntary strikes one as rather odd or at least as counter intuitive. How can a fire be seen as unconditional good as the only beneficial fire we know is experienced only from a distance, safely contained in a engine block, or behind the door of an oven or the shield of a fire place. Get too close and it is fatal – it doesn’t purify, it destroys. The analogy only holds in certain respects, and utterly fails in others. Hey Robert, the analogy is typically God as the fire and us as impure metal. His fire refines us and burns away the impurities. I believe the image comes from the Bible’s concept of the “refiner’s fire”, purging impurities from the metal to leave only pure gold. I do see what you are talking about, and though acknowledging and agreeing to an extent that image of God as fire and us as metal that is being refined with impurities being burnt away as Craig suggests is true also, it is perhaps only a partial aspect of the image, and as you say Robert needs to be mediated on further. One thing might be to consider what the image of God as a consuming fire might lead us to think off, to following with the refinier’s fire concept, this is something that can and does go on now, as God is present in all things refining and healing us even now, sometimes to extents that on the surface might not even seem to have much apparent effect (perhaps someone still feels like they struggle continually under a certain temptation, spiritual affiliation and so on) and that it might not be till being in the presence of His Light that the full nature of the refining becomes clear (the tares being separated from the wheat growing within them as it were). We can also see it and feel it both for ourselves and in the experiences of saints, mystics and just everyday faithful that as they draw closer to God their can often feel and sense themselves to be unworthy and terrible, to be as St Paul put it, the ‘chief of sinners’, that His consuming Fire is nothing less than the clarity of His Love and clarity and healing that brings that lets us see our wounds and conditions more clearly and with clear perception in heart and mind. 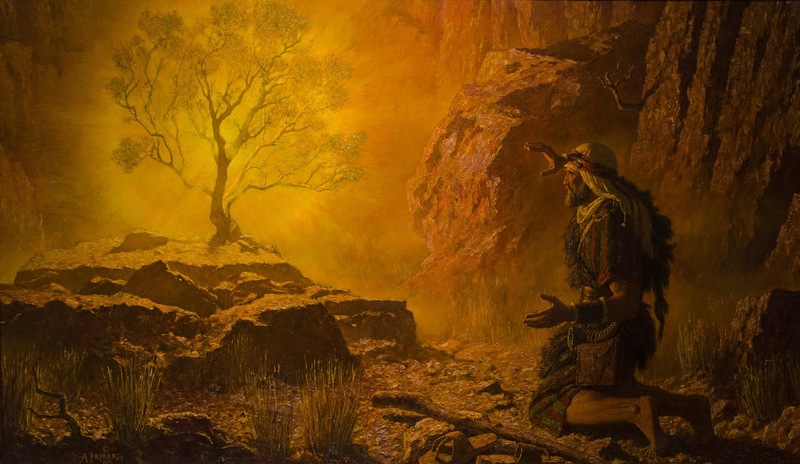 After-all, in the Gospels the fire the Lord baptizes and brings with Him, brings clarity, love, healing and repentance, as on the road to Emmaus ‘their hearts are strangely warmed’ as they meet the Risen Lord, unaware of who He is yet. However they come to understand the Truth of the Scriptures, the veil is lifted increasingly from their minds and their hearts, and at the end they see Him, and they know their Lord and themselves much more clearly. Again we can see this with the gathered Church at Pentecost, when the Holy Spirit descends as not only a rushing wind but as tongues of fire bringing clarity, understanding, the conviction and strength of God’s love. And though fire is not mentioned, this clarity in the presence of the Lord can be seen in Simeon Peter, after Jesus performs the miracle of casting out the nets bringing in a large catch of fish, he says ‘depart from me Lord, for I am a sinful man’, again the clarity and understanding when drawn into God’s love and understanding ourselves as well as Him more clearly. Or in the book of Isaiah when the prophet is depicted as coming into the Lord’s Presence and immediately understands himself to be unclean, coming into God’s presence and His Love strips away all illusions, confusions and deceits both from ourselves, others, the world and all things, and as there, the burning coal that is given heals the prophet, cleaning him and helping make him whole and more himself. The fire restores, even though initially it seems overwhelming, and both Isaiah and St Peter feel unworthy, the ‘chief of sinners’ and that sorrow of betrayal of His Love, this in all cases leads to the fire that brings healing, consuming their confusion and the darkness that blinded them, and consuming the afflictions of sin, that is death by healing them and making them whole (again both is Isaiah and definitely in both Emmaus and with St Peter and St Paul realizing his previous blindness and having a ever clearing understanding of himself as He understands God and is brought fully into the Life of the Holy Trinity through Christ). This can seem already consuming sometimes, as MacDonald mentions He remains always for us, and therefore against that which hurts, damages or impedes us, as the Great Physician He tries to bring us His confused patients to seeing our condition and more to place of healing. For now that Light shines in our darkness as St John tells us in his Gospel, like a patient physician trying to gently bring us and gently work in our confusing to see our condition, trying not to case to much discomfort, but eventually greater clarity and action might be needed, so while to an extent now we can hide from that clarity and the clear clarity that being in His Presence, the illuminating fire of His Love, hiding in the darkness of our illusions, eventually the light of Christ will dispel all darkness, and we will see ourselves completely and as in Emmaus or Peter see and understand both the Lord and ourselves through that far more clearly, and more strongly then either of those two examples. At first for many it might indeed seem daunting, even fearful to come fully into that clear light, which dispels all illusions both without and within, even as it would free us, just as the image of Adam and Eve, have them attempting to hide from God’s light and not wishing and fearing the clarity of self-understanding that would bring, not wishing to know their true nature, blaming each other, and thus being locked out of Paradise, or Cain denying his true self in God’s Presence and preferring out of fear of himself more than even God to go away and hide in the darkness of the wilderness. It’s why Moses fears and cannot yet look clearly at God in the narratives in Exodus story, it is the same reaction as St Peter, yet it heals and brings clarity and freedom, gladness, hope and love once His Love infuses us and His Light makes not only our hurts but the healing action that takes us out of death’s hold and affect, even as it does now for us to the extent we do engage and allow the fire to illuminate us and show us Himself and who we really are, not only now, but as we press forward who we are in Him. Eventually there will be no darkness and it is true that saints already dwelling more in His Presence and it’s healing fire will embrace and rejoice then those who actively seek to hide in the darkness of illusion of sin and death. However as they seen and known Him outside and within their innermost being, and deeper than that in the fullest clarity, even as it first might seem very terrifying (and even now we know the fear of true exposure, it still drives us all, and many would rather face much discomfort and pain both physical and emotional then be truly exposed) will also bring freedom. As with image of Adam and Eve, it will lead in that process to clarity and the Truth and Love and is Jesus Christ, even as it leads to sorrow of understanding the nature of their following the illusions of sin and the betrayal of Love, that fire will as in the image of Isaiah set them free, consuming their hurts by healing and raising them out of it. That is how I see it and understanding it as I think and look through to see what the fire of the Lord in which He illuminates and baptizes us looks like, and see it in these terms anyway. As such I agree that the image is important but needs to be expanded upon, and linked with other images and narratives. Aaaaaaamen. I’ve had this same dream for quite some time now. Wonderful, Father. I am sharing this. George MacDonald’s sermon “The Truth in Jesus” (also linked to from that main page) is why I am now Orthodox. That sermon literally haunted me for many, many years, because the explanation of the Gospel that he rejected was pretty much what I had believed for over 50 years as a Protestant. And when he pointed out to me in that sermon that I could be very wrong in what I was taught and believed, it really staggered me. It wasn’t until I discovered Robert Webber and his Ancient-Future faith books that I found a resolution to the quandary I was in. I knew nothing about Orthodoxy before reading his books. So I consider both of them (both Protestants) to have started me on the journey to the Orthodox Faith. And then Fr Thomas Hopko and Fr Stephen Freeman, among many others, finally brought me into this wonderful Faith. Sometimes I think that most doubts regarding the nature of God’s love would be alleviated if only Matthew 5:26 were correctly and authoritatively interpreted, that is, along the lines which George MacDonald interprets the verse not only here but in other of his Unspoken Sermons. The “uttermost farthing” is an obscure phrase to most Christians I think with the exception perhaps of Catholics who might cite it as early evidence of the doctrine of purgatory. It certainly was an obscure verse for me. But if it means what is appears to mean, that after death punishment is both meaningful and limited, then it could become in the context of the hermeneutics of hell the “stone the builders rejected which became the chief cornerstone”. I say this because the verse bears the authority of a saying of the Lord from perhaps the most well known chapters of the Gospels and because when the verse is heard without any preconceived notions about the nature of hell then the meaning of the verse seems self explanatory. I don’t know of any author from the first four centuries of the Church who strains the verse (in my opinion) to interpret it as referring to everlasting punishment. Of course once the paradigm changed decisively a century or two later the verse had to fit the mold of unending punishment. At any rate, those are my two farthings.